Who’s Cooking on a Lang in Portland, OR? Sacha Snyder and Dan Weidinger were interviewed by OPB for a series of articles about At Home: Conversations Inside Homes Across Oregon. Their article is called “At Home In The Bull Run Watershed” by Julie Sabatier and Alan Sylvestre. There’s a great article and a video (slideshow with audio). 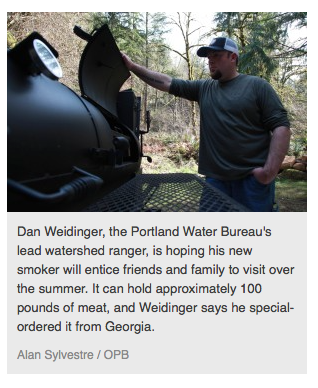 In the video the interviewer sees (our smoker cooker) and asks him to tell him about “this behemoth” – Dan lovingly talks about his “pride and joy” and how much meat he can cook on it.